While having families in the neuro ICU improves patient outcomes, it presents additional challenges for delivering care for nurses like John Scala, who has worked in neurocritical care for seven years. It was not the same woman that Jason Forche saw lying in the bed in room 52. One moment Sally R.* was alert and talking. She knew her name and that she was in Emory University Hospital. A 39-year-old mother of two, Sally was glad her husband was with her. The next moment—just 30 seconds later—Forche, the nurse responsible for Sally’s care, knew something dramatic had happened. None of the vividly colored monitors surrounding the bed had blinked, changed their readouts, or uttered a peep. Everything seemed the same except Sally had stopped talking to her husband. To the untrained eye, that would mean little, but in a neurointensive care unit that treats brain injuries, nurses are keenly aware of any sign that suggests something is amiss. Quickly, Forche called the nurse practitioner in the unit, explained what he had checked and what he thought had happened, and together they rushed Sally to the diagnostic CT machine down the hall. The scan was negative. Forche then whisked her downstairs for an angiogram, and as he feared, Sally was experiencing a cerebral vasospasm, a potentially lethal constriction of a brain artery. It had clenched shut, depriving parts of her brain of blood and oxygen. A quick infusion of strong drugs reopened the vessel. 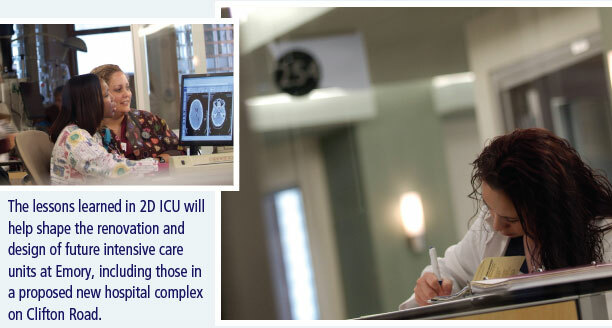 Welcome to 2D ICU, a unit unlike any others at Emory, or like few in the United States. In both form and function, it is a place where physicians, nurses, and staff are applying an emerging model of hospital care. Here families stay with patients 24/7, if they like, and clinical care is led by neuro intensivists, a relatively new breed of MDs who specialize in treating critically ill patients with brain injuries. And it is on 2D ICU that nurses are migrating from the monolithic central nursing station found on most modern hospital floors back to patient rooms, to be as close to the bedside as possible—the place where nursing care is traditionally valued. Accompanying this transition, these nurses also are assuming bigger responsibilities. They are providing input into how patients should be managed as well as what should occur in a crisis. They are drawing on the newest technology to provide smoother, coordinated care. They are encouraged to move up the professional ladder and earn additional certification—and many do. And in an even bigger way than in the past, they are proving an indispensable resource not only to patients and their families but also to the entire clinical team. “Nurses are more than my eyes and ears. They are my eyes, ears, mouth, hands, everything,” says Owen Samuels, medical director of the neuroscience ICU program. 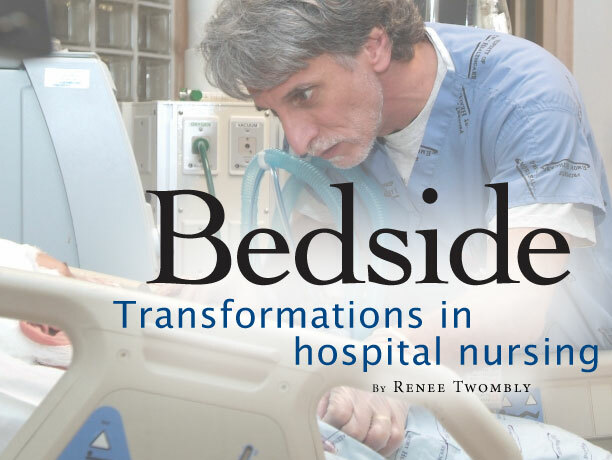 The building of 2D ICU represents a convergence of medical, cultural, and market forces at play in health care, changes that help explain transformations in hospital nursing. Foremost among them is that some hospitals are morphing into a collection of critical care units that treat the sickest of the sick. Emory Hospital, because of its tertiary-care status and the breadth of specialties operating here, has long been one of those facilities with a burgeoning critical care census. At the same time, because of new national restrictions on the number of hours that residents and interns can work, there are fewer residents on the units to treat patients than before. The traditional resident-fellow-attending academic model has become strained, and nursing shortages and a dearth of critical care specialists have plagued hospitals not only in the Emory system but also across the country. Simultaneously, health care consumers have become savvier, more willing to choose a hospital based on rankings in popular surveys, and on other criteria more akin to a shopping mall experience—the look and feel of the place, the customer service. Even as the Emory neuro ICU was dealing with these changes, it was growing fast. From a single seven-bed unit in 1998, Emory’s neurocritical care has expanded now to include almost five times as many beds in three units. Occupancy now averages more than 90%, says Ray Quintero, department director of 2D ICU. One of the reasons for the rapid development of the service is that patients are surviving catastrophic brain injuries thanks to quicker, more advanced treatment. Another is that many patients are referred here for procedures that are unavailable elsewhere. For example, Emory is one of the few hospitals in the Southeast to offer a less invasive treatment for aneurysms, or life-threatening bulges in brain blood vessels. This technique involves threading a catheter through the patient’s groin up into the brain, and depositing a tiny coil in the bulge to block blood from entering. More typical treatment for an aneurysm involves use of a titanium clip to bind the bulge, which first requires a craniotomy to remove part of the skull. While placement of the coil is less invasive, it requires a huge amount of technology in the care of these patients. And because complications may arise one or two weeks after coiling or clipping, such treatments require one of the longest hospital stays of any disorders, Quintero says. Long before 2D ICU was built, Samuels saw how these long stays combined with resident shortages could damage the quality of care delivered in the ICU. He turned to mid-level caregivers, what are known as physician extenders, to fill the “care gap.” These physician extenders include physician assistants, surgical assistants, nurse anesthetists, and nurse practitioners (NPs). NPs are registered nurses who have completed advanced education and rigorous training in the diagnosis and management of illnesses. As such, they are able to provide a broad range of health care services. On the neuro ICU, “they do all sorts of complex, high-risk procedures, which would have been unheard of years before,” Samuels says. Among them are placement of invasive centralized arterial lines and pulmonary artery catheters as well as lumbar punctures and drains. As NPs increasingly were given authority in neurocritical care and as the number of beds and the services grew, responsibilities also grew for experienced bedside nurses. With patient safety as the top priority, they have the power to stop care if they feel uncertain about a process. Yet through all this increased responsibility and empowerment, the element that can’t be diminished happens at the bedside. It is the human touch. The tragedy that unfolds daily in the neuro ICU underscores the fact that anyone can suffer a sudden and devastating neurologic event. The disorders treated here are not the exclusive province of the elderly. His point was made when, as the night nurse in charge, he rounded on patients in 2D ICU. On this typical evening, the patient mix included a woman in her 30s with a cranial bleed caused by taking ten tablets of ephedra a day to lose weight; a 31-year-old man in a coma from a steroid-induced stroke; and seven patients, aged 39 to 72, recovering from aneurysm treatment. In older models for delivering intensive care, families in shock huddled together outside the intensive care unit and were asked to refrain from intruding when the medical team held rounds to discuss patient care and prognosis. The scenario was less than ideal, says Samuels. When Emory administrators decided in 2005 to expand the busy neuro ICU, Samuels put together a team of nurses, neurologists, pharmacists, social workers, design experts, and family members of former patients to figure out how to move caregivers back to the bedside. So the team set about to design a unit “where the family and the patient are not objects of treatment but are full participants in the whole healing process,” he says. And that meant that nurses and families, too, returned to the bedside. Yet in 2006 when June’s 22-year-old daughter, April Sharkey (above, left), joined Emory as a nurse in the same unit as her mother, she entered a dramatically different environment. The younger Sharkey’s experience of nursing is as “the patient’s advocate,” she says. There is no other critical care unit like 2D ICU in Atlanta, and few in the country. Its form has helped further define the function of the patient care team. Patient-centered care is not new in Emory Hospitals. The hospital care teams have followed the philosophy for years, but they have been hampered by the design of the physical plant. By contrast, 2D ICU, which opened in February, features a new design tailored for 21st-century health care. Among its features are a large waiting area for family members, with a kitchenette and a children’s play area on one side. Like a hotel concierge, two assistants take turns staffing a welcome desk, offering solace along with towels for the shower room or soap for the washer and dryer. Within each patient room is a separate studio area for family members, with chairs that open into beds. Soon, the suites will have laptop computers. 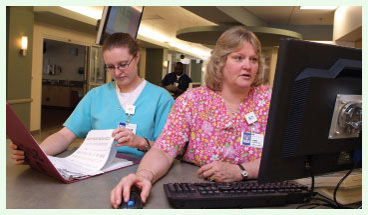 When not at the bedside or in treatment areas, nurses work from alcoves situated between patient rooms. They have only to glance in to see and hear the patients and to monitor IV fluids and a myriad of machines. Often, a probe is embedded into the brain to measure temperature, oxygen, and intracranial pressure, and transcranial Doppler ultrasound is available to look at the velocity of blood flow. A CT scanner is just steps away. Families come and go and are welcome to talk with physicians and nurses during rounds. 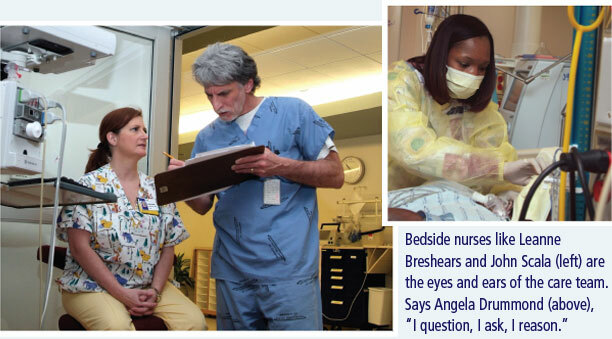 Their presence has put nurses front and center to answer questions and provide information. Quintero sees this change as positive, emphasizing the needs of the patient before those of the medical team. To create an environment where nurses become invested and can contribute the most, Quintero has turned to the nurses themselves. “I tell them, it’s not my unit. 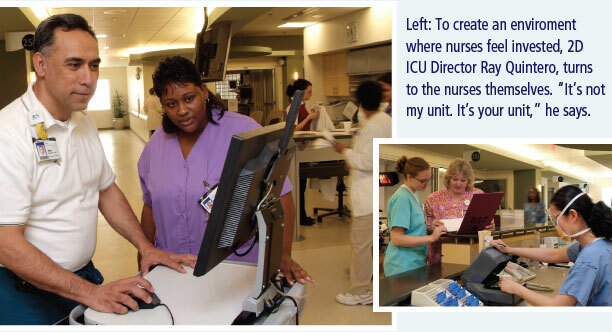 It’s your unit.” Creation of 2D ICU involved shared decision-making, a process that sent a team of nurses across the country to search for the perfect equipment boom for the patient rooms, among other tasks. “I know what nurses need because I am a clinical nurse too,” says Quintero, who has 25 years of hands-on nursing experience, including 20 years as military nurse in Texas at the Air Force’s largest hospital. Everyone in 2D ICU is adjusting, figuring out what works and what doesn’t, and where the limit exists for just how much nurses can do, says Samuels. In a sense, 2D ICU is a demonstration unit that is transforming the culture of patient care, says Susan Grant, chief nursing officer for Emory Healthcare. The lessons learned here will help shape the form that future intensive care units in the proposed new Emory Hospital complex will take. But just as family-centered health care, along with new technology and better designed physical space, improves outcomes, so does the evolution of nursing practice. Grant herself began her professional career as a bedside nurse at Emory. In the 20 years since, as a nurse and nursing administrator serving in educational institutions across the United States, she has witnessed firsthand the changing profession. “We are far beyond Florence Nightingale’s day, for sure, but we have gone miles beyond what nursing was even five years ago,” she says. The professional practice of nursing now is responding to and being proactive around technology, research, medical advancement, reimbursements, regulations, risk aversion, and disease management, Grant says. Nursing as a discipline needs especially to be more central to the health care administrative process. 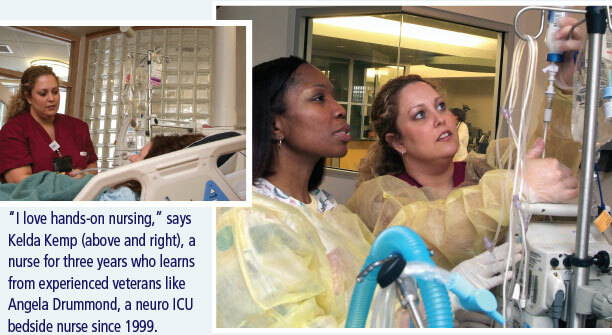 For all those reasons, Grant is taking nurses throughout Emory Healthcare on the kind of progressive journey that neurocritical care has navigated. She is seeking to have the entire Emory Healthcare system awarded “magnet” recognition, bestowed by the American Nurses Credentialing Center. Magnet status is exceedingly hard to come by. Only 11 health care systems have been so designated since the program began more than 20 years ago. Only 4% of U.S. hospitals—238 out of 5,764—have earned these credentials, which may take up to seven years. The magnet program is designed to provide consumers with the ultimate benchmark by which to measure the quality of care offered by nurses, and by extension, their institution. “This is not window dressing. High nursing standards really improve patient care,” says Grant, who in a previous position led the University of Washington Medical Center through two renewals of credentialing for the magnet program. Emory Healthcare has already instituted a “shared decision making” structure across its system to include input from workers at all levels as well as from families. And on the floors, nurses are engaged in “unit practice councils” that identify practices that could be improved and then determine how to make that happen. ventilator-associated pneumonia as two areas of concern. Nurses have researched the existing rates, matched these to national averages—“too high,” Drummond says—and are now seeking ways to lower the incidence. In the space of just two meetings, they have found that two very low-cost yet high impact solutions will help: proper hand-washing on the part of all clinical staff and mouth care for patients every four hours. Magnet designation also comes when nurses develop professionally, and on that score, Emory has a good leg to stand on, says Grant, who also serves as the first assistant dean for clinical leadership at the Nell Hodgson Woodruff School of Nursing. “As far as nursing education goes, you can do anything at Emory Healthcare,” Drummond says. The neurocritical care nurses seem to take that slogan to heart. Of the 87 registered nurses working in the three ICUs, nine are taking graduate courses, and six are studying to be nurse practitioners. Ironically, a commitment to staff advancement also has the potential to create rapid turnover in nurses and even shortages—the very thing professional development is supposed to bring to an end, says Sharkey, who spends a lot of her time training new nurses. Part of the challenge on this frontier of transforming health and healing, then, is to balance new empowerment and knowledge for nurses with the traditional hands-on care they deliver at the bedside. That will create the strongest kind of magnet for patients and nurses alike. Renee Twombly is a freelancer who writes frequently on health care topics.